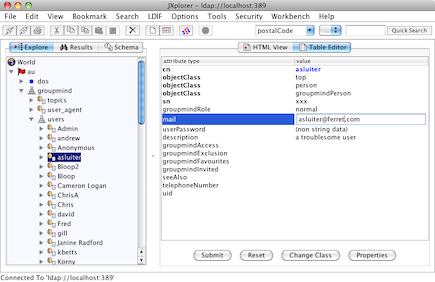 JXplorer is a cross platform LDAP browser and editor. It is a standards compliant general purpose LDAP client that can be used to search, read and edit any standard LDAP directory, or any directory service with an LDAP or DSML interface. It is highly flexible and can be extended and customised in a number of ways. JXplorer is written in java, and the source code and Ant build system are available via svn or as a packaged build for users who want to experiment or further develop the program. JX is is available in two versions; the free open source version under an OSI Apache 2 style licence, or in the JXWorkBench Enterprise bundle with built in reporting, administrative and security tools. JX has been through a number of different versions since its creation in 1999; the most recent stable release is version 3.3.1.2, the July 2016 release. 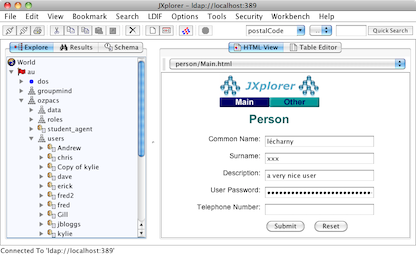 JXplorer is a fully functional LDAP client with advanced security integration and support for the more difficult and obscure parts of the LDAP protocol. It has been tested on Windows, Solaris, Linux and OSX, packages are available for HPUX, AIX, BSD and it should run on any java supporting operating system. Multiple Windows with inter-window copy/paste, paged results, and a new translation into Hungarian. You can get the latest stable install package of JXplorer on the Package Downloads Page. If you're after the source code, or one of the sub-projects (such as the Security Keystore UI or the LDAP/JNDI mock classes), you should look at the general Downloads page, which gives details of what's available and how to check things out from the http://sourceforge.net/projects/jxplorer/ sourceforge repository, or you can get the same code from github at https://github.com/pegacat/jxplorer. There's a lot more information, including an online version of the Help System, available on this site. Browse the menu links or search the site to find Documentation resources, more information on the various Components that make up JXplorer, and the details of the Open Source Licence. In addition there are a number of active mailing lists (try jxplorer-users@lists.sourceforge.net) where further help is available, (or indeed your problem may already have been addressed in the mail archives). We would like to acknowledge the efforts of the many people who have contributed bug reports, code fixes, and of course the extensive translation files to the project, and who have helped so much to improve JXplorer and make it what it is today. Chinese: For *both* Traditional and Simplified Chinese; Evereasy (Evereasy@gmail.com) - awesome work! French: Thanks to Luc and Serge, and more recently Bruno Haleblian (bruno_haleblian@carrefour.com) for updates. Hungarian: Richard - many thanks. And thanks also to many others who wished to remain anonymous, or who we've lost track of, including those who did the original French, German and Japanese translations! CA for the initial Donation of the JXplorer source code in 2002. SourceForge for providing a home for the project. Intellij IDEA for donating licences for their fine java IDE to JXplorer. BitRock Install Builder for donating a licence for their excellent cross-platform installer product. Australian Cloud Identity for their sponsorship of this project and this website.